Paper mill sludge can be refined into organic chemicals, biogas and soil conditioner, among other things. The research on the value chain of paper mill sludge has yielded preliminary, technically and financially promising results on utilising sludge for the production of chemicals and biogas or methane and as a soil conditioner or fuel after quick composting. The research will continue with, among other things, estimates on whether profitability can also be expected for the projects at an industrial scale. The future district of Hiedanranta in Lielahti used to accommodate forest industry that operated in the area for over a century until 2008. The sediment of Näsijärvi lake in front of the former paper mill has accumulated wood-derived waste fibres from the pulp industry. The sludge was first dumped directly into the waters as sewage and later submerged in a banked-up basin for several decades. The accumulation of sludge reflects the previous decades' more lenient attitude towards industrial waste and, in fact, the operations always complied with the legislation of that time. Similar paper mill sludge deposits can be found elsewhere in Finland as well as around the world. • The challenge is both extremely demanding and very interesting, and its solutions play a substantial role not only in Tampere but possibly around the world, as paper mill sludge is not unique to the waters of Näsijärvi. Success requires mutual problem-solving between businesses, the city, and universities as well as combining different types of expertise and viewpoints, says Associate Professor Leena Aarikka-Stenroos from Tampere University of Technology, one of the participants of the research cooperation and process. According to research, the lakebed in Lielahti contains 1.5 million cubic metres of paper mill sludge, covering an area of 35 hectares with a sediment that, in places, is several metres thick. The City of Tampere has acquired the area along with its environmental responsibility, and the goal is to find a financially and environmentally sustainable processing solution in order to make the area viable for recreational use. At the moment, the paper mill sludge causes unpleasant odours at times and hinders the lake's ice cover in winter and is, therefore, not suited as a milieu for the planned housing development. The plan is to remove the sludge at least from the vicinity of the shore to enable the recreational use of the area. The City of Tampere has attracted a great deal of interest with its desire to process the accumulated paper mill sludge in a sustainable manner, and several operators and research institutes have expressed their willingness to provide their know-how, participate in the project and test their own methods. • Various methods for processing paper mill sludge have already been studied. We have considered both processing the sludge on-site in Hiedanranta and delivering it to waste processors, energy companies and other material refiners. The mass-stabilisation of paper mill sludge and utilising it in park infrastructure has also been examined, says Project Development Director Reijo Väliharju from the Hiedanranta development programme. Stored at the bottom of a lake for decades, the paper mill sludge, its characteristics and potential processing methods are currently being studied by several businesses, experts, research institutes and higher education institutions. 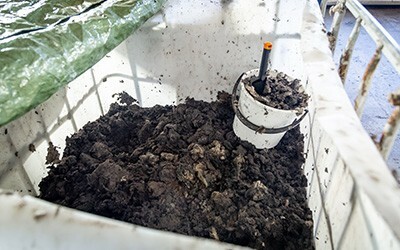 At the moment, the City of Tampere is running two publicly funded research projects related to paper mill sludge: The Blue Bioeconomy project for utilising the paper mill sludge in the lakebed of Hiedanranta, also known as the Zero waste from zero fibre project, and the CircVol 6Aika project with its paper mill sludge challenge and building a business network. The Zero waste from zero fibre project aiming to utilise the paper mill sludge in the lakebed of Hiedanranta studies microbiological processing methods designed to refine the sludge into as high-value products as possible. Depending on the processing chain, paper mill sludge could thus be refined into organic chemicals, biogas and soil conditioner, among other things. The project has been funded by the City of Tampere and the Blue Bioeconomy priority project of the Ministry of Agriculture and Forestry managed by the South Savo Centre for Economic Development, Transport, and the Environment. The CircVol Six Cities project aims to utilise large-volume secondary flows and landmasses in the urban environment. The project is part of the Six Cities cooperation project for sustainable urban development between the six largest cities in Finland: Helsinki, Espoo, Vantaa, Tampere, Turku, and Oulu. The project has been funded by Leverage from the EU 2014-2020, the European Regional Development Fund and the Helsinki-Uusimaa Regional Council. The City of Tampere aims to find a solution path for the processing of paper mill sludge in 2019. The goal is to find functional solutions from a combination of new ideas hopefully discovered in the current projects and the seminar. Cooperation with businesses is vitally important. The businesses should be given the opportunity to discuss their views on the used procurement process and to offer necessary solutions. • We want to have an open and diverse dialogue with businesses and developers to find the best solutions for paper mill sludge. The seminar featured the most up-to-date information on the processing options which we hope inspires the operators to find new business opportunities, emphasizes Project Development Director Reijo Väliharju. A city district of up to 25,000 residents and 10,000 businesses is planned in Hiedanranta with connections to the upcoming tramway line. The goal is to develop the area into a carbon-negative district that supports sustainable environmental development in an intelligent manner. An open-minded culture of experimenting is one of the means of achieving this goal.